When you eat something loaded with sugar, your taste buds, your gut and your brain all take notice. This activation of your reward system is not unlike how bodies process addictive substances such as alcohol or nicotine – an overload of sugar spikes dopamine levels and leaves you craving more. That’s why moderation in all things is important. Organic food can still be very high in sugar and is often no better than regular food, so don’t be fooled. 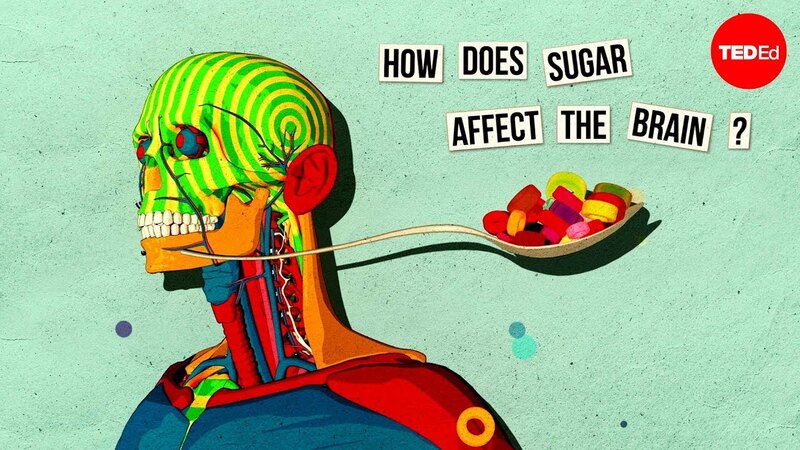 Watch the video here How sugar effects the brain and decide for yourself. Imagine how society would function if drug dealers pumped 150 to 175 pounds of heroin per person per year into the veins of the elderly, the middle-aged, and the young alike. Legally. Well, sugar, an addictive substance that speeds along the same brain pathways as heroin, enters the food supply in those quantities. The result of this sugar surge is that more than one in three adults now has either Type 2 diabetes or its harbinger, pre-diabetes. Include those under age 18, and 105 million Americans are harboring a life-threatening blood-sugar disorder. According to lead researcher and Princeton psychologist Bart Hoebel, PhD, “Our evidence from an animal model suggests that a binge on sugar can act in the brain in ways very similar to stimulant abuse.” As with any food issues, the sugar situation will only worsen barring drastic intervention and widespread lifestyle changes. Consuming too much sweet stuff is lighter fluid for Type 2 diabetes, and U.S. Centers for Disease Control and Prevention estimates that by 2050, the disease, in its full form, will inhabit as many as one in three U.S. adults. Add in the far more numerous pre-diabetics, and you may be hard-pressed to find anyone with healthy glucose metabolism by the middle of the 21st century. Are you stuck? Traci D Michel helps us decide. We’re all a little Pavlovian when it comes to certain foods, but if your mouth waters every time you walk by a bakery case, candy aisle or bowl of ice cream, especially when you’re not hungry, something is up. You have a hard time just having one. Whether it’s candy, cookies, pastries or jelly beans, stopping is always the hardest part. In fact, it’s not unusual to eat to the point of feeling sick. Every time you eat starchy or sugar carbs, you tell yourself that you’ll cut back later. You know you can just do without the bowl of pasta or handful of M & Ms, but there’s always another day, right? It’s true there’s always tomorrow. But when tomorrow never comes, there’s a problem. You’re distracted and can’t stop thinking about your next snack or carb-filled meal. This type of distraction isn’t hunger related, it’s all about the food. You can’t get on with your day until you appease your craving. Portion sizes start to increase. You used to be able to get by on just one or two small cookies, now you eat half the box. You’ve made the decision to cut out sugar and now you feel horrible. Withdrawal symptoms or increased cravings are not uncommon, but do subside with time. Sanctuary House @ Pathways provides treatment that integrates scientifically-supported principles of nutrition, exercise, and psychology that will help participants adopt new behaviors that will contribute to a healthier and more satisfying way of living. Heal body, mind and soul and live the life you are intentioned to live.